These differentiated Spring math craftivities include addition, subtraction, multiplication, and division options. 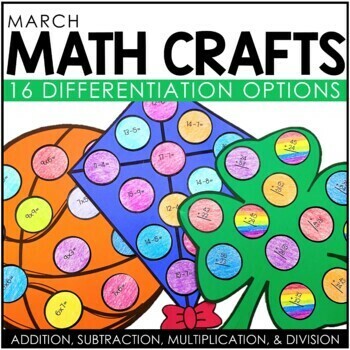 In this March Math Craftivity, you will find THREE craft options: a clover, a basketball, and a kite. I suggest copying the craft pieces on colored paper. Leave the circles white so students can color themselves. If you love math crafts, you might want to check out the BUNDLE and SAVE! Need more differentiation options? Check out the BONUS differentiation bundle! Copyright © 2018 Jana Guerra at We Heart Teaching. All rights reserved by author. Permission to copy for single classroom use only. Electronic distribution limited to single classroom use only. Not for public display.